Malty Sweet, Reddish Amber Hue & a Spicy Floral Hop Finish. Light. Our Amber is a sweet, malty, medium-bodied ale with a spicy, floral hop finish. It’s brewed with 2-row Pale, Crystal and Chocolate malts. And we hop it with Mt. Hoods and Cascades. We’re as proud of it today as we were back in ’89. And over the years it’s earned 14 Gold Medals. Not that we’re keeping track or anything. My friend Joe has been waiting or Full Sail to arrive in our area since this summer. Just a few weeks ago we realized that State Line Liquors just added Full Sail to their lineup. Joe proceeded to purchase several Full Sail beers and in turn gave me a sampler of the Session Lager, Session Dark, Amber and IPA. So this is the third out of four Full Sail reviews. The beer pours a clear rich amber with ruby hues and an off white to tan head. The dose is delightful with caramel malt aromas along with a very pleasant floral hop aroma. Oh My, that’s good, really good. 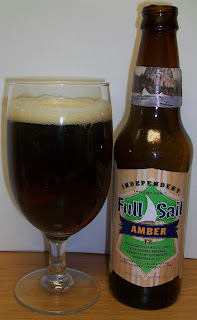 This is nice Amber Ale with just the right amount of caramel malt flavors and clean floral hop finish. The experience starts out with sweet caramel malts up front then a nice effervescence over the tongue in mid-sip. There are also building malt and hop flavors toward the back-end. The back-end is still fairly easy drinking with a nice carbonation release during the swallow. The finish is great, smooth and clean with nice caramel malt flavors and very pleasant light hops that dry with just the right amount of bite. The finish is not better but the hop presence is unmistakable. There is a slight lingering aftertaste of light hops and caramel malts. We have warmed to 58 degrees. There is an interesting spicy note on the finish as this beer warms a little. The head has diminished to a patchy island and a ring around the top of the beer. It is also leaving some modest lacing. This beer is really opening up as it warms. The malt flavors are much more pronounced now. There is also a nutty almost toasted note to the malt flavors now. All and all this is a nice Amber Ale. This is a solid B maybe even a B+. It is a very clean Amber Ale with wonderful caramel malt flavors and pleasant light hop finish along with some interesting spicy and nutty notes.